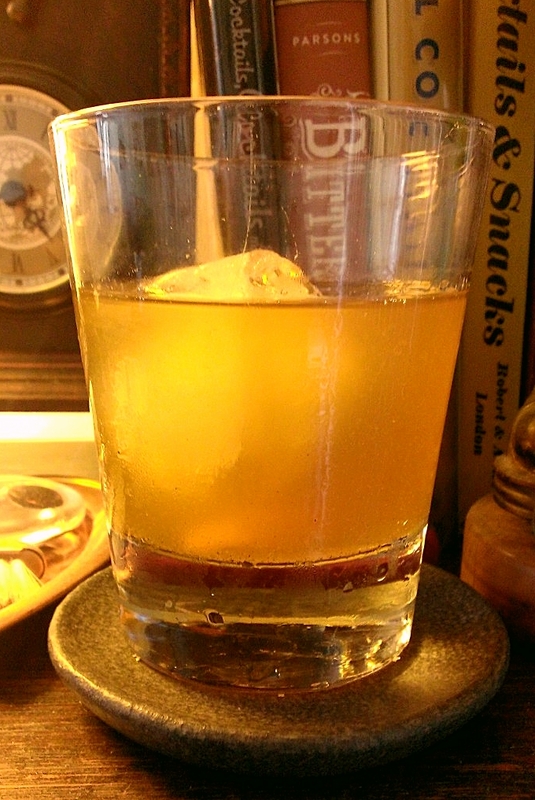 I don’t play with rum terribly often, aside from the occasional Dark and Stormy, or when my darling wife asks for a rum drink, though I suppose I should. This number came about from wanting to do something with black pepper and orange flavors, and when I was scanning over the bar, my eyes fell on the bottle of Pyrat XO rum, and that was that. All ingredients were shaken hard with ice, then strained through a fine sieve (to catch the ground pepper), and served over a single large piece of ice, and garnished with a small piece of orange peel. If you haven’t had Pyrat XO, it’s a rum offering from the good people at Patrón. It’s a rich, deep amber color, and carries a decently palpable orange note, and some characteristics that remind of nothing so much as cognac. It’s an aged rum, and while it is the youngest of the Pyrat family of spirits, this makes the XO a smooth, flavorful, and sweet (while not cloying) rum that is perfectly fine being sipped on straight or on the rocks. As I said, I wanted to play with orange flavors, so the Pyrat seemed a solid choice. To add to that, and play up the cognac-like characteristics, I went with Grand Marnier for the orange liqueur. While I thought these flavors would work well together, I found I had a terribly sweet drink on my hands already. Add to that even the small bit of fresh orange juice, and this drink was really at risk. By upping the rum from 1 part to 1.5, and doubling the bitters from 3 to 6 dashes and giving a couple more grinds of pepper, I ended up with something I quite liked. There is an undeniable taste of orange, but it focuses more on the bitter orange peel side than the sugary sweet. The excellent Fee Brothers Old Fashioned bitters helps with this, as well as highlighting the black pepper, and make that bite a little more complex. So, there you have it. The Jack Rackham; a drink perhaps the old captain himself could have enjoyed sipping on while watching the rolling of the sea.